Note: You may wish to view the how-to video on this subject. The Hackolade roadmap foresees specific versions to support workgroup collaboration, assuming the base version is successful commercially, and that the market needs this feature. But what can be done in the meantime? It was a design choice from the start to store Hackolade data, not only in JSON format, but also in a non-proprietary text based form. This choice enables easy tracking, control, and versioning of model changes in Hackolade. at this stage, merging and conflict resolutions would need to be performed (carefully) in a manual way... until a Workgroup edition of Hackolade is released. Here are some basic Git principles and commands to be used in combination with Hackolade. The commands are executed with a Git client (such as SourceTree), as Hackolade does not yet have a Git client integrated. After initial cloning of the Remote repository for models, it is a good idea to change the user parameters to point the default path for models in Hackolade to the Local Git repository. 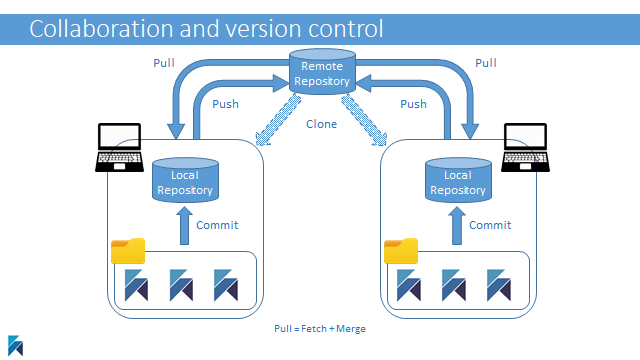 Before making any changes to a model, it is a good practice to perform a Pull (which in effect does a Fetch from the Remote repository, followed by a Merge.) After making further changes locally in the model using Hackolade, don't forget to save your changes, then perform a Commit (and a description) and a Push so your changes are made available in the Remote repository. Resolving conflicting changes can be a tedious process involving manual intervention. It is therefore advised, if several users collaborate on the same models, to Pull the latest changes from the Remote repository prior to making new changes. Then make sure to save changes, then Commit and Push to the Remote repository. Sometimes, it may be a good idea, if working on the model for a new release, to Save As the current model to a new version by giving the model file a new name, for example by appending a version number at the end of the file name.